The centrally located Comfort Hotel Xpress Tromsø presents an entirely new hotel experience that is smart, efficient and focused on what you need. Let us guide you to the best restaurants, museums and experiences in Tromsø! We are a cash-free hotel. The Comfort Hotel Xpress Tromsø is located right in the city centre, within walking distance of all the main sights and attractions! The Comfort Hotel Xpress Tromsø is unique! Since opening in 2014, the hotel has been offering its guests modern technological features in vibrant surroundings. We have done away with any unnecessary extras for a simple and efficient hotel experience! And that, put simply, is what makes us unique! The Comfort Hotel Xpress Tromsø has lots of smart solutions and is ideal for all those wanting to avoid costly extras such as rooms service and minibars. You needn't go hungry though with a great range of food, drinks and snacks available for purchase in our lobby shop that is open 24 hours a day! We also do our best to minimise our carbon footprint and you will see many environmentally friendly solutions here at the hotel. There's no restaurant and we don't change your towels or bed sheets every day, for example. When you stay in the heart of Tromsø, everything is within easy reach. The main street is literally around the corner, but there are many other hidden gems to discover. Tell us what you are looking for and we'll guide you there. Do you fancy a bike ride? Then go ahead and rent one of our bikes! Read more about Tromsø here. You're in luck! There are lots of foodies working here at the hotel who know Tromsø like the back of their hand. Just ask us for tips to guide you to amazing restaurants in the city to suit all tastes and budgets. So, whether you're in the mood for a burger, simple snacks or an unforgettable fine dining experience, visit Tromsø! Tromsø is located on the island of Tromsøya, perfectly situated in the North Sea between Arctic hills, beneath the midnight sun and with the northern lights for a neighbour. Head out on magical ski trips, snow safari, boat rides, discovery tours and many (MANY!) more amazing adventures in nature. We have 192 smart hotel rooms offering compact accommodation with vibrant décor and modern furnishings. In order to be able to offer you affordable hotel rooms in central Tromsø, we will not clean your room every day. If you are staying with us for longer periods, we will clean your room every four days. We can of course come and freshen up your room for a fee - just let us know! If you have any questions about this, please contact us and we'll be happy to tell you more. The Comfort Hotel Xpress Tromsø is a cash-free hotel, which ensures added security for our guests and visitors. More information about this can be found under FAQs. 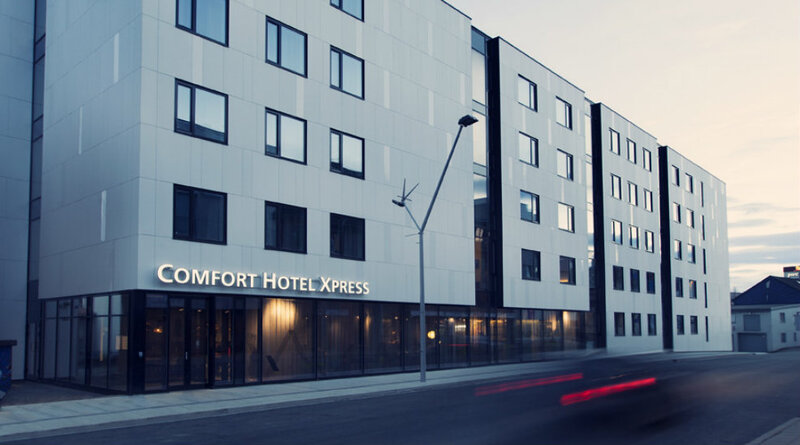 We hope to see you soon at the Comfort Hotel Xpress in Tromso – a perfect choice for modern, price-conscious travellers!